Heffron Drive Announce Concert in Mexico On October 4th! That’s right!! Heffron Drive are taking their live show down to Mexico in October. 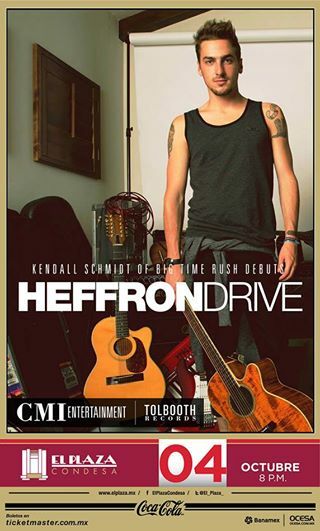 Kendall Schmidt, Dustin Belt and bandmates will be playing at El Plaza Condesa on October 4th. Tickets go on sale this Friday, July 25th on Ticketmaster! Watch Heffron Drive perform their debut single “Parallel” live at the New Jersey State Fair below. Pick up a copy of “Parallel” on iTunes now and keep requesting the song at your local radio stations! Don’t forget to follow Heffron Drive’s Kendall Schmidt and Dustin Belt on Twitter. Follow Secret Fangirls on Twitter for the latest on your favorite artists!